I have a chocolate obsession, mix that with a little hazelnut goodness and you my dear friend have an exquisite product called – Nutella. I discovered this small jar of heaven while in Rome, Italy and it is delicious. I’ve started up my cooking/baking obsession again and decided to try a recipe I found online (thank you recipiegoldmine!) for these Nutella & Peanut Butter Brownies. My family and co-workers loved them – they are my taste testers! 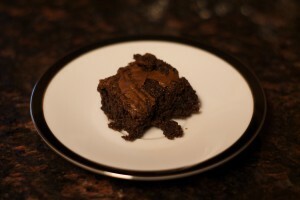 Please note: For fudgey brownies leave out the baking powder – they will still come out great just make sure they are COMPLETELY cooled before you cut. bb – make these for me and put them in the mail! your mail-person will eat them!